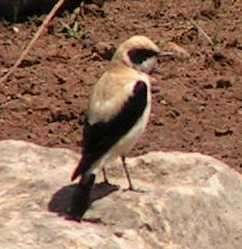 To judge by the trip reports available on Internet, Tunisia is a country much undervisited by birders in the spring. 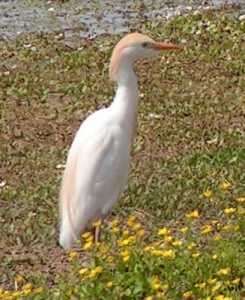 It has plenty to offer both for bird-lovers and history-lovers, plus comfortable tourist resorts. Although April would probably be the best time for the spring migration, we were restricted to May by school holidays. We went for the first two weeks of May 2005. It turned out that there was plenty to see. 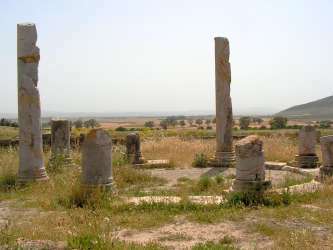 The area we visited was north-east Tunisia: roughly the area within a 100 km radius of Hammamet. We stayed at Hotel Marina Palace in Yasmin-Hammamet, chosen more for its availability in a reasonably-priced package than for any intrinsic merits. No complaints. We decided to “play safe” by hiring a car with the package – it came from Avis. There was nothing much wrong with it, but we thought it very expensive for what we got. One can probably do better. Most trip reports on Tunisia comment on the driving. Indeed many Tunisian road-users – both drivers and pedestrians – display the characteristic third-world indiscipline which can be quite a culture-shock to someone used to Britain or the U.S. But if you've driven for a few weeks in Latin America, as I have, you've probably encountered worse. Yes, you must constantly remain alert. But traffic is light in most areas, and I mostly enjoyed driving in Tunisia. Driving is on the right (more or less). Road surfaces are generally in good condition, with just enough exceptions to keep you on your toes. Watch out particularly for railway crossings: some are so rough that even the local taxis drive over them at walking pace. Road markings are generally in poor condition, which doesn't matter because everyone ignores them anyway. Signposting is generally pretty good between towns, a bit more patchy within towns. I took my GPS but didn't need it, though I was glad to use it as a compass a couple of times to check I was going in the right direction. Except for the toll motorway (Péage) don't expect to achieve high average speeds, because of the number of villages you travel through. Incidentally the Péage from Tunis to Bizerte is now open (it was shown as under construction on our maps). Tunisia is full of police checkpoints. Whether this is normal or the result of the current terrorism flap I don't know. They mainly stop trucks, but we were stopped a few times – apparently more for a friendly chat than for examination. Always keep your passport with you. Our weather was mostly warm and sunny, with as variation two dull days, a couple of very hot afternoons, one extremely windy day, and two or three brief showers. This is about normal for the time of year. French is the official second language of Tunisia and everyone we met could speak it. Knowledge of English seems to be more confined to the main tourist areas. Most signs are bilingual Arabic / French. Prices in the tourist areas are a little lower than ordinary (i.e. non-tourist) prices in north-west Europe. But if your needs are modest and you use the ordinary local shops, prices are very low indeed. A loaf of bread is under 20 Euro-cents, and some days the four of us picnicked for about one Euro! Petrol is about half of British/Dutch prices. Instead of describing the trip day-by-day, as most trip reports do, I have done this site-by-site, as that seems to me to be more useful to other birders. The order is roughly north to south. Our hotel did not have a particularly luxuriant garden, but it nonetheless housed breeding Spanish Sparrows, Spotless Starlings, Palm Doves, Blackbirds and Greenfinches. Sardinian Warblers and Spotted Flycatchers were continually present and probably breeding, while House Martins and Serins were breeding next door. These all proved to be common and widespread species throughout most of the area we visited. Once out into the countryside, other common species included White Stork, Hoopoe, Woodchat Shrike, Great Grey Shrike, Fan-tailed Warbler and Corn Bunting. My books show both Spanish Sparrows and House Sparrows occurring throughout the area we visited. However, although Spanish Sparrows were indeed common, I failed to find a House Sparrow on the trip. Every time I thought I'd found one, it proved on closer inspection to be a poorly-marked Spanish Sparrow, or perhaps a hybrid. 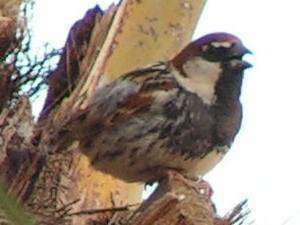 Which leaves the question – has the House Sparrow suffered a population collapse in Tunisia, much as in northern Europe, but one which cannot be blamed on modern farming practices? Or has it hybridised out of existence? Or were the maps always misleading? 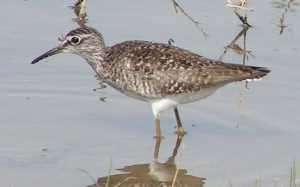 Lake Ichkeul is the most famous birding location in Tunisia. 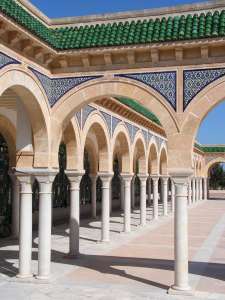 It was perhaps rather ambitious to visit it from Hammamet: it is a five-hour round trip. The park is well signposted. I wasn't expecting the large concentrations of duck and sandpipers which one finds in the winter – which is just as well, because we scored a big round zero with both groups!! Nonetheless, with a bit of searching there were quite a few water-birds to be found on May 8: Squacco and Purple Herons, Cattle Egrets, Spoonbills and both Black and White Storks. Other highlights included Short-toed Eagle, two Stone Curlews, Little Owl and Bee-eaters. The bushes along the water's edge held a few migrant passerines, of which the best was a male Collared Flycatcher. One warbler puzzled me for a long time; eventually I decided that (barring Asian mega-rarities) it must be an exceptionally bright Willow Warbler – the primary projection was too short for Wood Warbler. On the whole I think Ichkeul is worth visiting in May if you are in northern Tunisia anyway – we saw seven species that we saw nowhere else – but possibly not if you have to come all the way from Hammamet. Korba is an excellent area and easy to find: the lagoons run for several kilometres between the main Nabeul-Kelibia road and the sea. You just have to hunt a little for good viewing spots. In the migration season almost anything could turn up. Birds I found on May 5 included 150 Greater Flamingos, 6 Marbled Duck, small numbers of Black Kites, Honey Buzzards, Marsh and Montagu's Harriers, 1 Common Buzzard, Little Terns, Pratincoles, plus dozens of Cory's Shearwaters offshore. In addition there was a very large hirundine migration: there must have been several thousand Swallows and House Martins that passed through during the course of the day. When we drove into Kelibia on May 5 I hadn't yet seen a Bee-eater on the trip. This turned out to be fortunate, as on spotting one on the telephone wires I screeched to a halt to take a closer look – and was astonished to be confronted by a green back. It was a Blue-cheeked Bee-eater – a very good bird for Tunisia. Between the old fort and the harbour about 10 Little Swifts were wheeling around, and a couple of Bulbuls were calling. The Cory's Shearwaters were joined by a number of “Manx-type” shearwaters (insert your preferred taxonomic designation here) and an immature Gannet. This hill is strongly recommended for migrating birds by some writers, but when we were there it was covered in low cloud. Along the main road near its foot we saw two groups of Bee-eaters. The scenic approach to Korbous from the south has unfortunately been closed by rockfalls. The approach road from the north – the col at the top, the descent into Korbous and the rocky coast – look very promising for birds, although I didn't find as much as might have been expected. On May 14 I found 3 Blue Rock Thrushes, a pair of Moussier's Redstarts, a Black-eared Wheatear and a Short-toed Eagle plus a few commoner species. This big area can be reached from route 26, the Soliman to Hammam Lif road. A turn-off is signposted "Plage" about 1 km to the west of the edge of Soliman (about 2 km west of the town centre). This big area looks very promising but was rather quiet when we were there on May 14: it was mainly notable for the number of foraging White Storks. Development is encroaching on the area: let us hope that part of it will be preserved. On May 5 we saw Black-winged Kites at three different locations along this road. This is a delightful spot. From route 35, Bou Ficha to Zaghouan, turn right at a crossroads a few hundred metres after the village of Bouachir. This leads to the top end of a reservoir created by damming the Oued Rmel. The bridge there is officially closed to vehicles, so the road is very quiet (an occasional pick-up truck still comes across). The spot is also reachable from Ain Saboune on route 28 (Hammamet to Zaghouan). Birds seen here during a brief stop on May 4 included Squacco Heron, Marbled Duck, Gargeney, Wood Sandpiper, Gull-billed Tern, Cetti's Warbler, and Little and Great Crested Grebes. On May 9 we added Ferruginous Duck, Temminck's and Little Stints, Ruff, Curlew Sandpiper and Lanner. None of my books (I have checked five) gives Sedge Warbler as breeding in Tunisia, or indeed anywhere else in North Africa. Neither did an Internet search reveal anything obviously relevant. Is this an important discovery? Nearby is a spot which sums up the delights of Tunisia. Just off the road are the remains of a group of Roman buildings. Anywhere in northern Europe this would be a major tourist attraction, complete with fences, car parks and stiff admission charges. Here the buildings just lie among the wild flowers for anyone to wander up to and admire. This is, together with Bouachir, my favourite spot of the trip. Djebel Zaghouan is the highest mountain of eastern Tunisia (1295 m), and is now a national park. Heading westwards on the main road through the centre of Zaghouan, turn left at a small roundabout where the main road bears right, onto a road leading steeply uphill. Although the Temple des Eaux is, strangely, not signposted from the main road, once you have found this turning it is signposted for the rest of the way up the hill. The Temple des Eaux itself is a roman temple marking the start of an extraordinary aqueduct which used to take water all the way to Carthage, over 100 km away. You can park here; there is a cafe. You can also take the road which turns sharp right immediately inside the park gates. This twists and turns up the mountain until at an altitude of about 800 metres you reach a board indicating the rest of the road is a prohibited military area. On May 9 we decided to go exploring and try an area I'd not seen described in any trip report. From Bouachir we took the minor road through the village of Oued ez Zit northwards through the hills towards Mornag. The southern half is well wooded and might well repay further exploration. We found Lanner, several Bee-eaters and a group of 13 Honey Buzzards passing over. From the highest point of this road, an unmarked and newly built (or perhaps reconstructed) side-road leads steeply uphill, revealing steadily more impressive views over the surrounding countryside. Following this, we discovered it led to a radar station on the peak of Djebel Sidi Zit at 750 metres. While we were admiring the view, a guard rushed out, told us that photography was prohibited and asked us what we were doing. I got the distinct impression that we were the first tourists he had ever encountered up there, and he was very unsure what he should do with us! He was very polite to us, but as he was obviously ill at ease, we decided to drive a little way back down the mountain and admire the view from there. As to the birds, highlights included Barbary Partridge, Short-toed Eagle, Thekla Lark, Moussier's Redstart and Black Redstart. Unfortunately the significance of the last one only occurred to me later: a Black Redstart in appropriate breeding habitat at this time of year strongly suggests breeding. My books have it as only a winter visitor to Tunisia, though it breeds in Algeria. So this is something for someone else to check out. 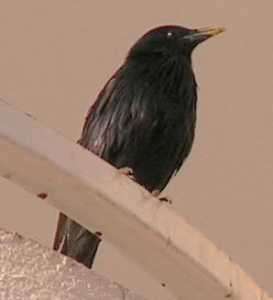 The bird (a male) was almost at the top of the mountain, by the last sharp bend before a watch-tower. No trip report known to Google refers to Djebel Sidi Zit, and this route would appear to be a new discovery. Returning to the through road we turned northwards and found ourselves in a delightful area of small-scale farmland. 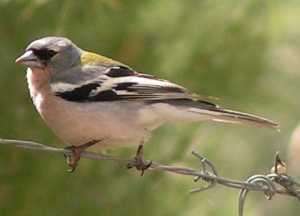 Barley fields and copses were full of the song of Nightingales, Serins, Quails, Bulbuls, and Bee-eaters. Other birds included Little Owl and Pied Flycatcher. Further along the road is the Barrage El Hama; we found only Great Crested Grebes here, but it looked promising. On the way back we stopped at the archaeological site of Uthina; a party of Lesser Kestrels was catching insects nearby. Also not mentioned in any report I found, this is a seasonal lake off route 1 (marked as GP 1) south of Bou Ficha and about 20 km south of Hammamet. 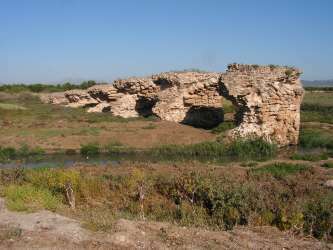 The closest access is halfway between kilometre-stones 57 and 58 (distance from Sousse). However I found the area by kilometre-stone 57 more productive, and also better parking. One can walk to the lake along the edge of a barley field. Good shoes and long trousers are recommended. The birds here on May 15 included a Red-rumped Swallow, a female Black-headed Wagtail (race feldegg or similar) and several Calandra larks singing. Other birds found in a 90-minute visit included most of the common farmland birds of Tunisia and also: 110 Greater Flamingo, 11 Avocet, 5 Curlew Sandpiper, 13 Little Stint, 1 Temminck's Stint, 2 Kentish Plover, about 50 small waders too distant to identify, 10 Slender-billed Gull, 2 Black-headed Gull and 8 Shelduck. This is a pretty big area, and who knows what a half-day visit might turn up? Three Little Swifts were over the centre of the village on May 13. North of Bou Ficha route 1 passes over a stream by the remains of what I presume to be a Roman bridge. Here I found the only Moorhens of the trip. They had newly hatched young on May 15. This is a small town on route 2, between Hammamet and Kairouan. Apparently well-known as a site for Little Swifts, it is still reliable. On May 6 I found them within five seconds of parking near the church in the centre of town, and on the two other occasions we drove through I saw them without even stopping. 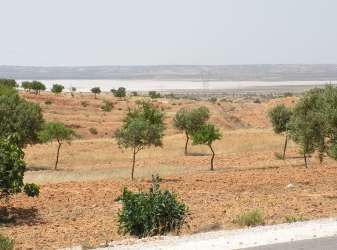 The north-west corner of this lake lies alongside the road from the GP 1 to Hergla, but on our visit it was almost dry and contained little of interest. The south-west corner, or more precisely the stream which runs into that corner, was however very different. This can be reached from the GP 1 about a kilometre north of Sidi Bou Ali. On the south side of the bridge over the stream you can turn on to a disused road which runs towards the Péage. On May 6 it was extremely windy, making observation difficult, but species present included numerous Slender-billed Gulls and Black-winged Stilts, 2 Marbled Duck and small numbers of Gull-billed, Whiskered and White-winged Black Terns. On May 10 I was able to add Ringed and Kentish Plover, Curlew Sandpiper and approximately 100 Little Stints. The Salinas at Monastir seem to be a bit of a lottery. Coming from the airport on May 2 they seemed almost deserted. On May 6 we gave them a quick look on the way to Monastir town, but found little apart from 10 Curlew Sandpipers and about 100 Slender-billed Gulls. Returning to the airport on May 16 there was much more present, but we had no opportunity to stop and look at it. However 70 flamingos were visible from the airport terminal. 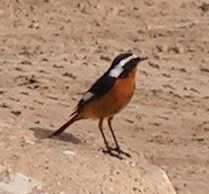 Heading south on route 2 on May 11, I was surprised when my son pointed out a Moussier's Redstart in the centre of Dar Belour village, near the mosque. All the books and trip reports I have seen identify this as a bird of rocky hillsides, mainly at higher elevations. Yet here was one in a built-up area in the breeding season. Could this just possibly the first step in an adaptation to human settlement such as the Black Redstart has made in Europe? 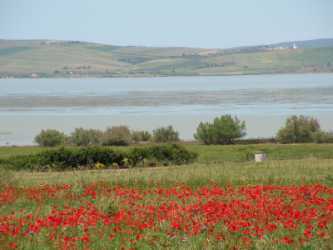 This is a seasonal lake between Enfida and Kairouan, accessible from route 2 south of Kondar. Using Kathleen and Ian Johnson's report we tried a farm track between kilometre-stones 30 and 31 (there are at least two other tracks available further south which may also be worth trying). The lake itself was dry, but there were numerous Calandra Larks singing and allowing good close views. Along the track we found Short-toed Lark, Lesser Short-toed Lark and Black-bellied Sandgrouse. There were also four distant "slender" harriers (Pallid or Montagu's). On May 10 we stopped briefly at another seasonal lake (unnamed on our map) near the village of Kerker on the GP 1 north of El Djem. An asphalt road heading westwards from the GP 1 just north of Kerker runs fairly close to the lake after a few kilometres. I did not find anything other than the commoner farmland birds. However there was still plenty of water in the lake, suggesting that it may repay further investigation by someone who doesn't have two children pleading to get back to the swimming pool! In addition we visited the Roman sites at Thuburbo Majus and El Djem, the Phoenician town at Kerkouane, the old medinas at Hammamet, Sousse, Kairouan and Tunis, the magnificent ribats at Sousse and Monastir ... and we managed to keep the children reasonably happy most days as well! Tunisia is a good destination for a birding trip, and an outstanding destination if one wants to combine birding, historic sites and resort activities for the children. Much of it still seems to be little explored by birders and there is scope for making your own discoveries. I did not see another birder in the whole two weeks! While one will probably see more bird species by going slightly earlier in the year, there is still plenty to see in early May. In May one has the benefit of more reliable weather, while the number of tourists away from the main resorts is still very low. Birds of the Middle East and North Africa, Hollom, Porter, Christensen and Willis.